Be the first to review this 2019 Jaguar F-TYPE. Now in its fifth year, the distinctly Jaguar F-Type has proven itself to be a car with character, a true-blue two-seat sports car, a coupe or convertible contender against the Corvette and Porsche 911, as well as the Porsche 718 Boxster and Cayman. The Coupe R and Convertible R are two of the best sports cars on the road today. For 2019, the four- and six-cylinder engines get names to match their horsepower: P300, P340 and P380. Meanwhile, the V8s carry on with their same names, the R making 550 hp and SVR making 575. Also new for 2019 is a 10-inch infotainment touchscreen. 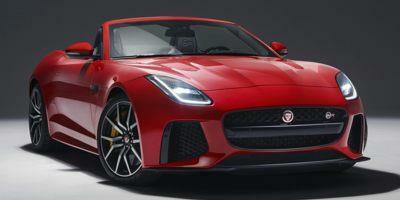 For 2018, the Jaguar F-Type added a turbocharged four-cylinder engine to its lineup, joining two supercharged V6s and two supercharged V8s. The P300’s 2.0-liter turbo four makes 296 horsepower, mated to an 8-speed automatic, while the 3.0-liter supercharged V6s are mated either to a 6-speed manual or the 8-speed automatic, with all-wheel drive available. The P340’s standard 3.0-liter supercharged V6 with 340 horsepower can accelerate from zero to sixty in 5.1 seconds and hit 161 miles per hour. The P380 with the same V6 making 380 horsepower knocks 0.3 seconds off that time and adds 10 mph to the top speed. The V6 engines sound a little coarse under acceleration, with the whine of the supercharger subdued and drowned by engine noise. The F-Type R with its 5.0-liter supercharged V8 making 550 horsepower accelerates from zero to sixty in 3.9 seconds, with a top speed of 186 miles per hour. Optional sport exhaust makes it sound throaty like a V8 Mustang. It’s all-wheel drive, mated to an 8-speed automatic. The F-Type SVR, also all-wheel drive, makes 575 horsepower and 516 pound-feet of torque, dropping the 0-60 time to 3.5 seconds and raising the top speed to 200 miles per hour. There’s lots of carbon-fiber trim, and a titanium exhaust system makes the engine downright raucous. Its suspension and steering are tuned for performance, while carbon-ceramic brakes are available. It needs a track to be pushed. The 8-speed automatic transmission with paddle shifters is just about the best automatic we know (that isn’t a twin-clutch). If you must have an old-school manual gearbox, you’ll have to stick to the base 340-hp F-Type with rear-wheel drive. It’s good but the sweet automatic shifts faster and gets better fuel mileage. The new turbo-four base engine is EPA-rated at 23 mpg City, 30 Highway, 26 Combined. The 340-hp V6 with 8-speed automatic rates 19/27/22 mpg, or 1 mpg less with all-wheel drive. The 6-speed manual brings it down to 16/24/19 mpg. F-Types with the 5.0-liter supercharged V8 get 15/23/18 mpg, with either 550 or 575 hp. All the engines require Premium gasoline. 2019 Jaguar listings within 25 miles of your ZIP code. Find 2019 Jaguar listings for sale near you.